In the United States, approximately 12,000 people become paralyzed each year due to spinal cord injuries. What if we had the technologies to help paraplegics and quadriplegics walk again—for instance, bionic limbs and exoskeletons controlled solely by thoughts? While these technologies sound like they belong in science fiction novels, they may become a reality in the near future. Just this February, a research team led by Dr. Thomas Oxley at the University of Melbourne published a paper in Nature Biotechnology, detailing their development of a new device to measure patients’ brain signals. This device, called the “stentrode,” is a tiny cigar-shaped net that measures only a few millimeters wide. It is light and flexible, and it can be collapsed and inserted into a vein near the motor cortex, the region of the brain controlling voluntary movement. The stentrode is a revolutionary device for recording brain signals, measuring only a few millimeters wide. Image courtesy of the University of Melbourne. Once settled into the brain, the stentrode expands to its original shape, and the electrodes embedded in the net begin to record the surrounding electric signals from nerve cells. Each electrode can pick up the signals fired by about 10,000 neurons. Delicate wires deliver these signals from the brain to the chest, which contains a wireless transmission system. This transmission system can convert the electric signals of the brain into special signals recognizable by bionic limbs or an exoskeleton. According to the researchers, the stentrode offers us a novel method of looking into the inner workings of the brain. 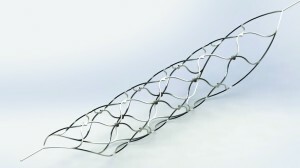 Not only is it biocompatible and minimally invasive, the stentrode delivers high-resolution signals of brain activity. The development of the stentrode was a huge project involving a team of researchers from the University of Melbourne, the Royal Melbourne Hospital, and the Florey Institute of Neuroscience and Mental Health. Dr. Oxley, who spearheaded the project, is a neurologist at the University of Melbourne and an endovascular neurology fellow at Mount Sinai Hospital in New York. To assemble the team, he reached out to top researchers in Australia, many of whom had already been involved with a project to develop a bionic eye. The researchers tested the stentrode in sheep brains for a period of six months, comparing the functionality of the device with that of a more traditional brain implant. They initially faced challenges while developing the device; to engineer the intricate structure of the stentrode, they went through several hundred iterations of unsuccessful precursors. The final design used a flexible material called nitriol, which is also found in bra underwires and glasses frames. Once they had achieved a final model, the researchers inserted the stentrode into the brains of healthy living sheep. Within hours of the operation, which was painless and quick, the sheep were walking and behaving normally. The researchers started picking up electric signals within nine days. They were able to detect signals with frequencies of 190 Hz—an exciting finding because signals between 70 Hz and 200 Hz are associated with the motor cortex. Previous devices to record brain signals were highly invasive and difficult to insert. In order to insert these devices, surgeons would remove a portion of the skull, and attach the electrodes to the surface of the brain or fire them into the tissue with a gun powered by air pressure. Since this invasive insertion process requires open-brain surgery, it often results in complications such as infection, brain trauma, and chronic inflammation. Furthermore, the body can set off an immune response and cover the electrodes in scar tissue, preventing them from functioning. On the other hand, the stentrode can be inserted painlessly and non-invasively without complex surgery. To insert the stentrode, a catheter holding the device is positioned over a blood vessel near the motor cortex. The catheter is removed after the stentrode is deployed. Then, the stentrode travels to the motor cortex and expands to fit into the blood vessel, where it can begin picking up electric signals from the brain. 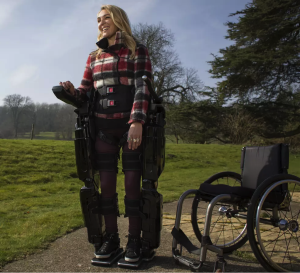 A thought-controlled exoskeleton similar to this one might become a reality for paralyzed patients in the next six years. Image courtesy of the University of Melbourne. The researchers explain that the stentrode holds many potential advantages compared to previous devices, including “improved biocompatibility, high-resolution signal transduction and long-term functionality.” The stentrode, once inserted into the brain, can remain in place and transmit signals for long periods of time without damaging brain tissue. In addition, the stentrode accesses information-rich signals from deep within the brain that previous devices could not pick up. The stentrode has many exciting possible applications, such as its potential usage in bionic limbs to restore movement to paralyzed patients. The electric signals of the motor cortex could be detected by the stentrode and sent to control bionic limbs or exoskeletons—for the first time, these mechanical devices would be powered simply by thought. The researchers predict that learning to use such devices would take many months of adjustment. Patients would have to master using their thoughts to direct an electronic limb or exoskeleton. Oxley likens this process to learning how to play the piano—first figuring out how to coordinate your hands to strike the keys in the right sequences, and then practicing to the point where playing the piano becomes second nature. Other potential applications of the stentrode include monitoring the brain activity of patients with neurological and mental disorders, such as Parkinson’s disease, motor neuron disease, OCD, and depression, or even predicting and managing seizures in epileptic patients. The researchers plan to conduct a clinical trial of the stentrode with human subjects in 2017. Dr. Oxley is optimistic that within six years, the stentrode will become commercially available for patients with paralysis and other conditions. And if his prediction is correct, we will soon undergo a revolution in the way we look at the human brain.